Pack size: 2 x 30ml solution bottles, 1 x 10ml eye drop bottle, 1 contact lens case & 1 travel zip bag. Travelling and contact lenses can sometimes go together poorly. Long periods in airplane cabins can be a recipe for dry eyes, while cleaning lenses can be awkward in hotel rooms and train carriages. With the Regard K RGP Solution Luxury Travel Bag, worries about combining travel and lens wearing should evaporate like the dirt on your lens. Formulated to ensure that gas permeable lenses stay moist during flights, the Regard K RGP Solution Luxury Travel Bag will be a valued partner on any long distance voyage. 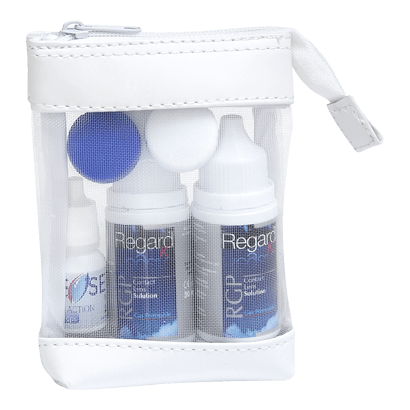 • Produced by Advanced Eyecare Research, the Regard K RGP Solution Luxury Travel Bag includes a path-breaking preservative-free cleaning solution that will not irritate eyes the way that Hydrogen Peroxide based solutions can do. • Effectively removes all dirt, grime, proteins and germs from the surface of contact lenses. • Coming in two 30ml bottles, the Regard K RGP Solution Luxury Travel bag will not pose problems with airport security. Also comes with a contact lens case and a handy bottle of eye drops to provide a moisture boost if necessary. • Particularly useful for any wearers of gas permeable contact lenses. Travel need not be a chore with this superb cleaning package from Advanced Eyecare Research. Have no problems with airport security, great cleaning performance and no irritation with this all-natural cleaning solution.